Whatever the reason, Le Bristol is a hotel that’s hard to get out of your system and which after only one stay feels like home. For one it’s family owned and it feels like it. Corporate touches are kept at bay (who else would keep a cat on premises?!) with as much gusto as the city’s luminaries are welcomed. Nicolas Sarkozy, for example, dined at the Epicure so much that he conferred the Legion d’Honneur on the chef, and models recharge from the runways (and the after parties ) of Fashion Week in the hotel’s gardens or rooftop pool. The looks are prestigious as the crowd, an exposé of classic French opulence and elegance (polished marble floors, explosions of colors from the flower displays, and a furniture selection that would fit right in the halls of Versailles) that’ll have budding designers taking notes. But the true draw, lies in in its three Michelin Star restaurant L’Epicure. Cut into the Brese Farm Hen. Believe us, the experience borders on the spiritual. Having lunch in the typical french atmosphere of the 114 faubourg brasserie, awarded with one Michelin Star. Le Bristol is the finest hotel we have visited. The staff and the service are outstanding. They know what you want even before you do. Leah Marshall, the hotel manager, is superb. We look forward to our return not just because we love Paris but because Le Bristol feels like home and the staff feels like family. From arrival to departure, Le Bristol delivers a hotel experience like no other. I think it is absolutely excellent in any possible sense. The attention to the guests is second to none. One detail that always makes me smile: On arrival I had my favourite Dome Chocolate cake served at my room. That is simply amazing! Thank you so much for it. Paris will be always be Le Bristol for us. We loved it,felt truly pampered but also because of our experience with your website. It is always a great pleasure to stay at the Bristol. It is a place we love very much. It feels good. Everyone is very attentive, courteous. An absolute fem ! The weather was fantastic, we enjoyed the garden and Café Antonia outside. Still a big thank you for the upgrade. We were &quot;very spoiled&quot; this made the stay even more enjoyable. We will definitely go back in November / December as usual and we're looking forward to it. A most enjoyable experience. The staff are excellent across the board. This is truly a world class hotel in all aspects. It is in fact the best hotel we have ever stayed. My wife and I, along with our 7 yr daughter have stayed at Le Bristol for the past three years. It is an absolutely wonderful place. It is as beautiful a place as you could want. But what makes this place so wonderful are the people that work there. They make you feel like family. They are truly remarkable from the senior management to the folks that take care of the rooms and facilities. We will stay no where else and will be back there again next year. Please pass out our highest compliments to the General Manager. We think it is the best in Paris. Very child friendly as well. A very pleasant stay in a palatial - but very relaxed - setting. It felt like a holiday home in Paris, staffed by friendly and professional people. It was paradise. Very beautiful. The staff greeted us like long lost friends. A wonderful hotel in every aspect, which at this level of perfection is rarely found these days. A hotel of outstanding quality. The staff is very professional and extremely pleasant. We are delighted and charmed. Whether it's your first stay, or you're a frequent guest, Le Bristol provides a truly exceptional experience unmatched by other hotels. It has become a regular stop of mine on any trip I make to Europe. I’ve said it before and I’ll say it again, we love le Bristol! It’s a magnificent place, with very efficient, friendly, and professional staff who always do their work with a smile. A palace hotel with a &quot;family&quot; atmosphere which makes it so precious and so warm. One of the paradise on the earth. I would like to say thank you very very much to all the hotel staff who served us during our stay this time. The Bristol is an excellent hotel that combines luxury and discretion. The staff will have you feeling comfortable with their warm personality and all smiles attitude. Very kind and available service in a setting that is nothing short of sublime. A stay in this Palace is like a living daydream. My fourth visit in a year. No other hotel comes close to the standards Le Bristol sets. From arrival to departure, staff show a genuine warmth and desire to exceed in customer service. Perfect, exactly what I expect of a palace hotel. The level of luxury and the friendliness of the staff are unrivaled, and it’s no exaggeration to call them the best hotel in the world! I fell in love with this hotel in June and my passion hasn’t died since! The staff is extremely attentive to your needs and you get the sense that their kindness is not for show because they’re professionals but that it’s genuine. A welcome and rare thing in this day and age. It will be a pleasure to come back. The best hotel ever !!!! Highly recommend and will return if I'm ever in Paris. Fabulous location and staff. Mon hotel prefere a Paris, absolument fantastatique, l`ambiance de luxe, personnel tres professionnel et tres aimable. GREAT THANKS. A lifelong memory... We will come back soon. Le Bristol is a wonderful property with a well trained staff &amp; management team. If we ever return to Paris, we will surely stay at Le Bristol. Outstanding service and property....we look forward to coming back! Hotel Le Bristol is my home when visiting Paris. It consistently sets the standard to which other hotels should aspire. The hotel facilities are top of the bill, but it is the staff at the door, the reception, the breakfast room, the 114 restaurant the bar and the claening ladies that make the hotel exceptional. The Original aspects of the hotel and the exceptional service make Le Bristol Paris the best luxury hotel, not only in the city of lights, but in Europe and in the world. However what makes le Bristol better than the rest cannot be seen with the eyes but is instead felt by the heart. You will find qualities here that go over and above excellent service as the staff have a sincere and heartfelt approach to their work. 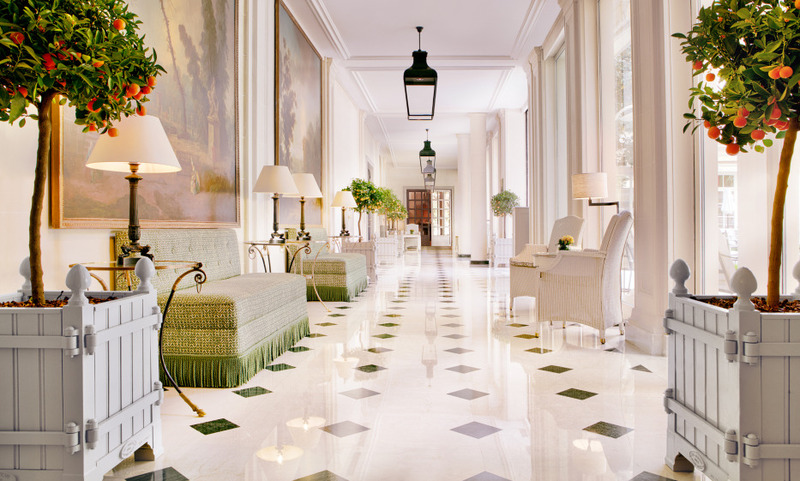 French “art de vivre” is given capital within these walls and we highly recommend this hotel. &quot;The art of French living&quot; has a name.. the Bristol Paris! The Palace is a beautiful oasis of happiness and excellence. Currently, the most awarded Palace throughout the city of light ... So you can not go wrong by choosing it. Your dreams will take shape in this timeless gem and extraordinary hotel! Lovely hotel and extremely friendly staff who went out of their way to make our stay special. Lovely breakfast, room and pool. The pool could be a little warmer as it was a cold winter weekend. I didn't have a chance to try the spa but will next time. The L GEM add ons convinced me to pick this hotel over the various 5* hotels we were considering and the follow up service was excellent. A great classic and elegant experience overall! one of the best hotels I ever stayed. the staff is incredible. you do not feel like going out certainly a place to return to. It was a great stay. We have absolutely no complaints. We will come again. Great hotel . Wonderful rooms with excellent decor. Bathroom shower was a little disappointing. Food quality and service is excellent and the staff were extremely courteous and helpful. Our shower pressure and shower head was a little disappointing given the hotel standard and other comparable hotels. Unforgettable experience. Quality of service and friendliness of the staff are exceptional. The hotel is superb as are all the restaurants of the hotel. The cuisine is a delight. The room was spacious, well equipped, faultless taste. Only downsides, bedding not comfortable enough for a hotel of this standard and street noise disturbing at night. Thank you to all the teams of the hotel and restaurants for their competence, their sympathy and their various gestures to my pregnant wife. Ideally located. The division of labor does not contribute to the effectiveness of the breakfast team. Very nice and perfect hospitality. We will be back and will try to book a table in the garden at Epicure. We had a perfect time at Le Bristol. Great hotel, perfect service, great food and very friendly staff. Le Bristol was magnifique. I want to stay again. The Bristol is the best luxury hotel I know.